Once Profile Grid has been successfully installed, to begin harnessing its usage, Groups manager is the ideal place to start. 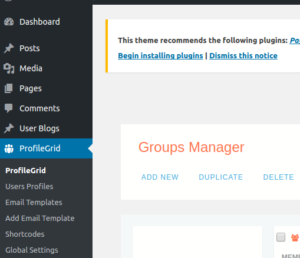 On the admin dashboard, Groups Manager will be accessible on the left hand-side menu, when user clicks on “Profile Grid”. ADD NEW: Allows creation of new Group. When option is clicked upon, the control is directed to “NEW GROUP” page that will contain various options relevant to the group attributes. DUPLICATE: As name suggests, clicking it will create a new blank group with same title and attributes as the selected one. This is helpful when creating similar groups with few attributes that differ. One can quickly create desired number of duplicates and then change the required fields via specific “Settings” option of each group. REMOVE: Allows deletion of the selected groups. Its non-reversible option and caution is suggested prior to removing of the groups. Each group is presented as a square card with important information displayed on it. 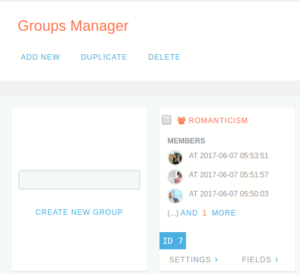 Groups Manager will show a maximum of 10 form cards at a time. After that it will show pagination on the bottom to navigate to other groups. Group cards are arranged in descending order based on their creation date. It means the group created most recently will show first. Checkbox: To Multi Select groups for Delete and Duplicate batch operations. Group Title: Identifier name for the group. Group Members:Snap shot of last few members added to the group, along with the date-time stamp. All the members can be viewed by clicking on “more” link. ID: The persistence storage ID associated with the group. It is the unique key that can help differentiate between groups having same names (especially when performing batch duplicate operation). Settings Link: To access Group Settings containing all relevant attributes for given group. Fields Link: To access Custom Fields Manager for associated group. New group creation functionality is also accessible via “Create New Group” card just below the operation bar containing “ADD NEW” link. To use it, just enter the name of the desired Group and click on “CREATE NEW GROUP”. It will immediately add a new card representing the group. 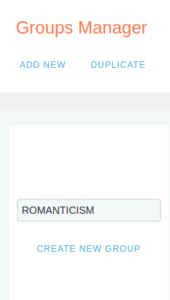 The details can be edited by going to “Settings” field on the newly generated card. It allows Admins to create a new group without having to go through the long list of options present in usual group creation page when accessed through “ADD NEW” link in the top bar. The benefit being, admins can first create Custom Fields and then come back to Group Settings page through “Settings” link or by clicking on icon on the Custom Fields Manager.